Introducing KidsafeBelt Luxor, a sleek and comfortable addition to our range of safety belts. - Safety buckle and strengthened strap with firm sewing. - Adjustable waistband, shoulder-band and hand-strap fits well for toddler babies. Light in weight, this Pavlik Harness can easily bear the weight of babies. Best in quality, these harness products are supplied to the customers in many shapes and sizes. Moreover to this, these harness products are presented in the market in many patterns and finely prepared with the use of soft fabric. 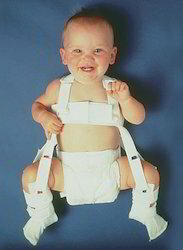 Bornlife Prosthetic And Orthotic Inc.
With the affluent acquaintance and understanding of this work area, we are actively occupied in presentingan extensive range of Baby Harness. KidSafe Belt, a safety harness that keeps your child comfortably strapped to you while riding the bike or scooter, especially if you have to make a sharp turn to avoid a pothole or to counter a skid.